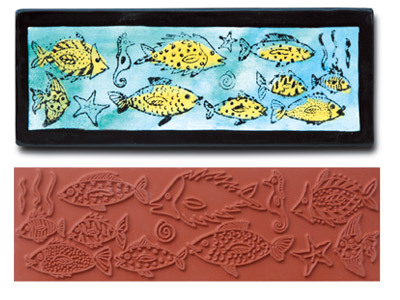 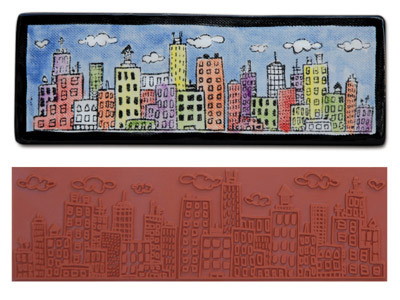 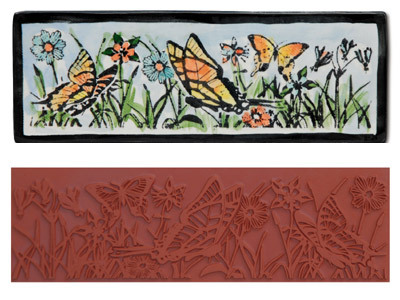 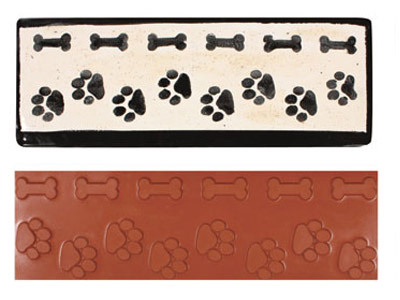 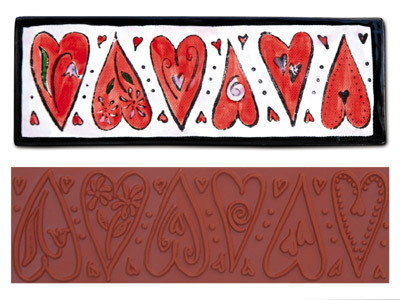 Carve your own rubber stamps with any design you can imagine and layout! 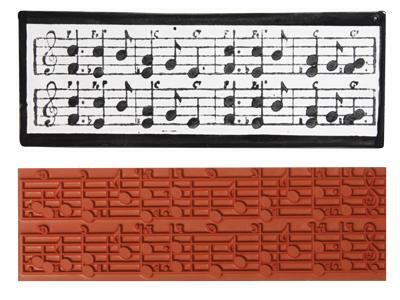 Double your value by using both sides, too. 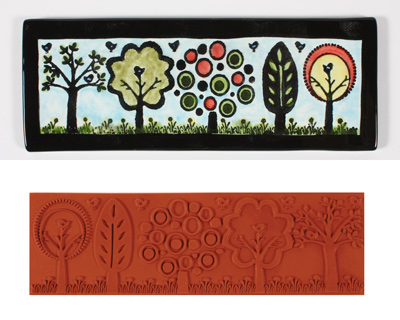 We included one of Stephanie Burton's tiles to show the scale: this sheet is BIG enough for large-scale design work! 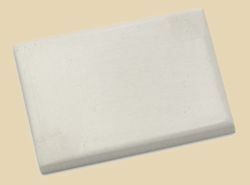 are 3/8" high x 1/4" wide. 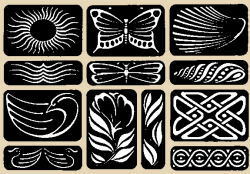 11 shapes from 1" to 1.5" each. 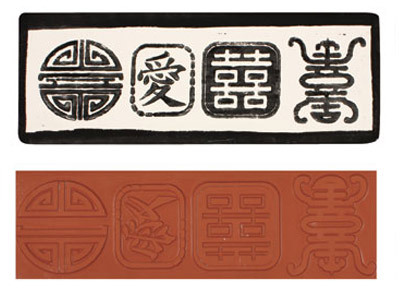 Spirit, Love and Endurance. 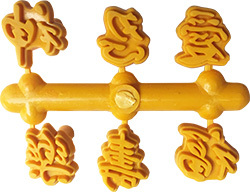 Six shapes approx. 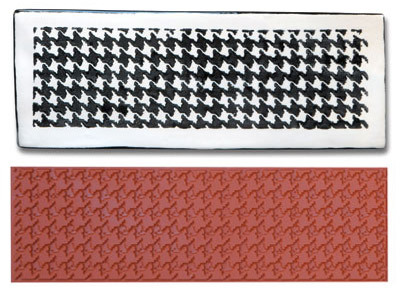 1" each. 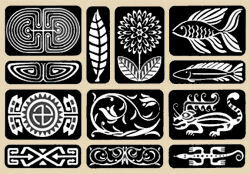 These eight designs may well have been inspired by printers' symbols, called "dingbats," once used as spaceholders and decorative elements in typeset layouts. 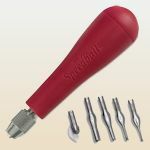 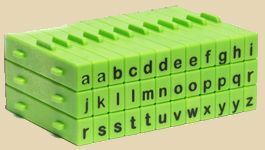 This set of 8 comes with instructions, one handle and 8 decorative stamps. 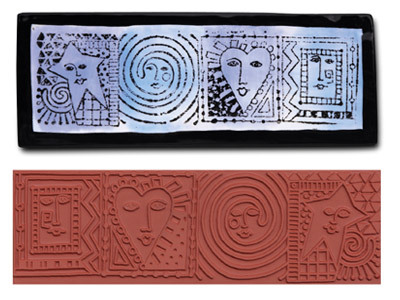 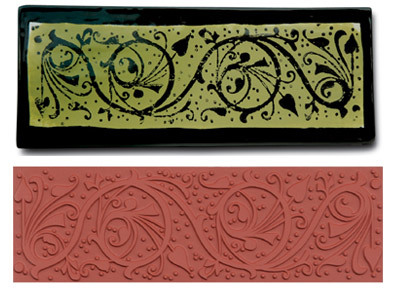 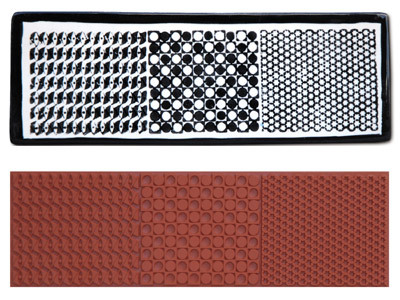 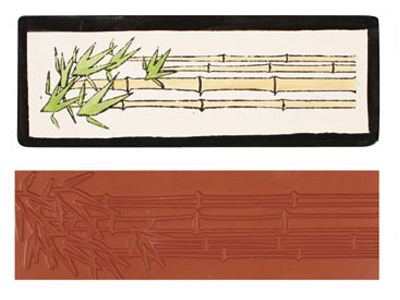 Dozens of design variations are both possible and easy with the Rocker Stamp designs. 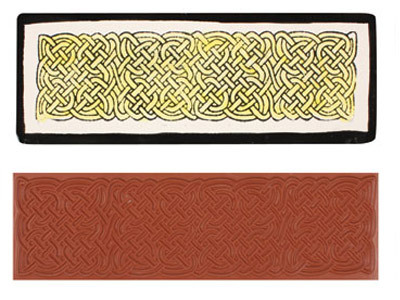 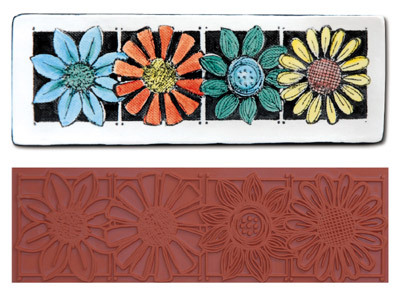 You can use one wide pattern, two narrow patterns side-by-side, or pair them with the geometric wooden stamps by MKM for even more possibilities. 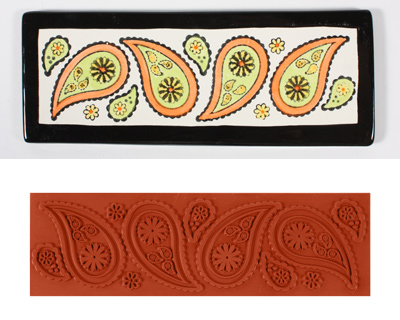 Try partial or overlaid pattern impressions, too. 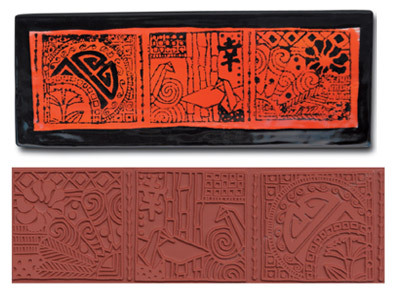 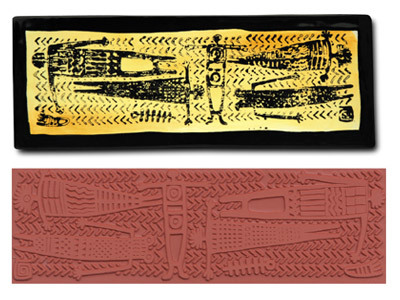 The unique design of the Rocker Stamp handle reduces the force necessary to make impressions in even the firmest of clays. 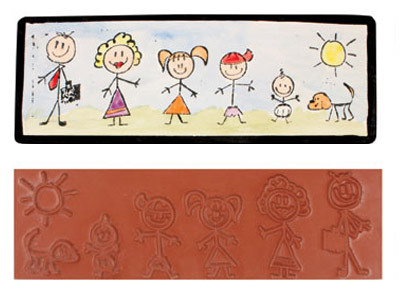 Rocker handle is included with either set of stamps. 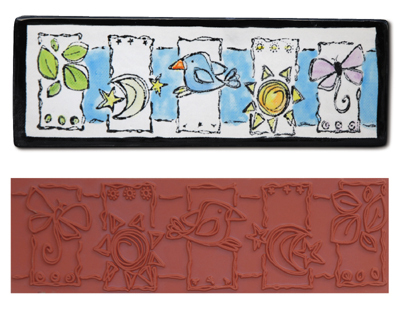 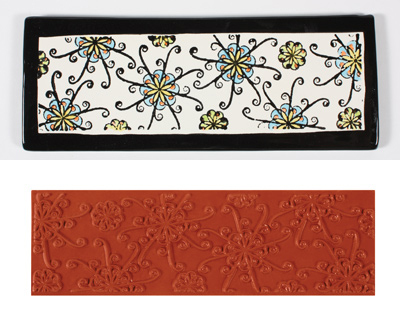 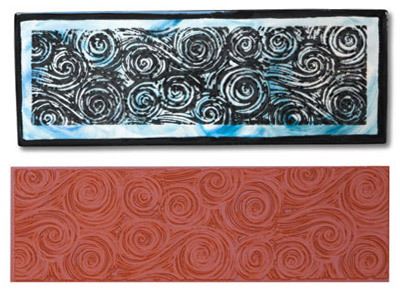 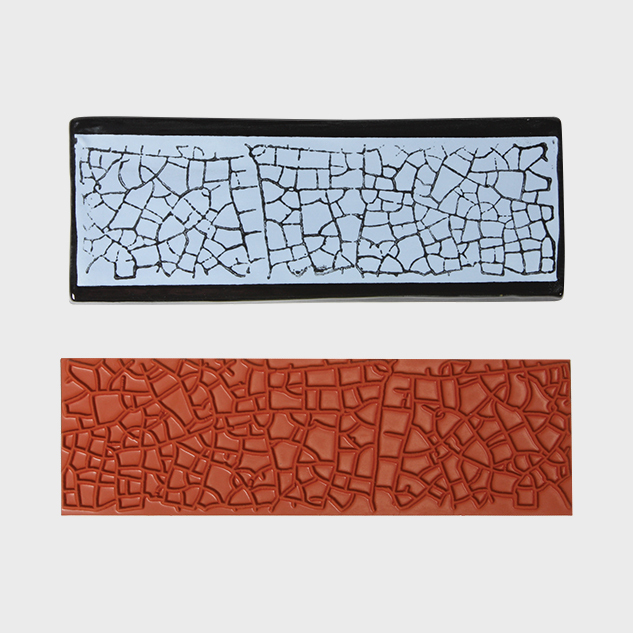 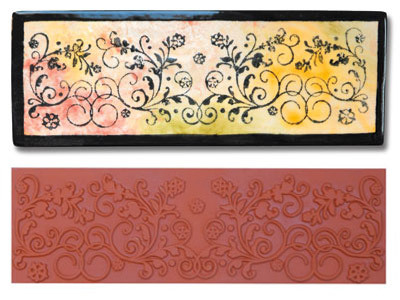 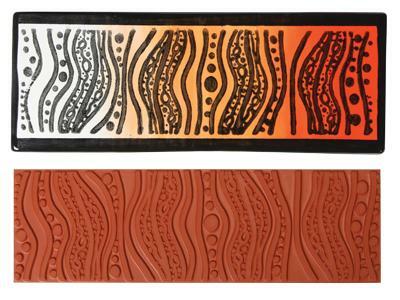 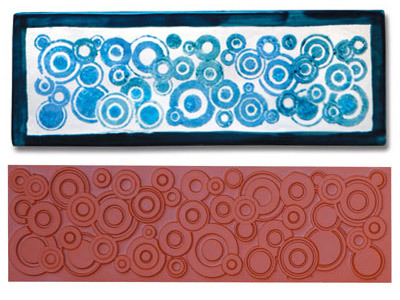 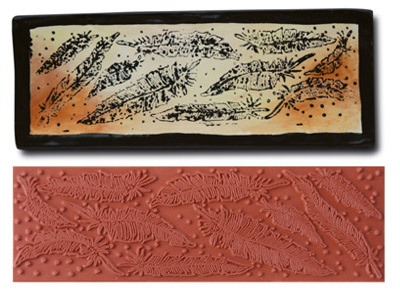 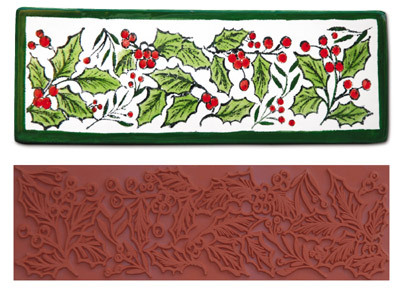 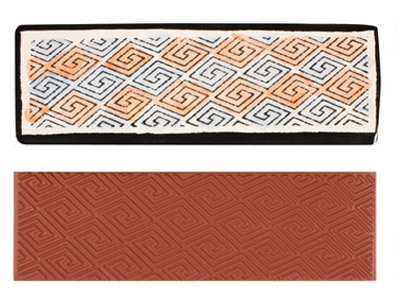 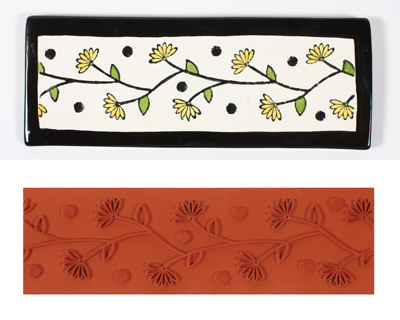 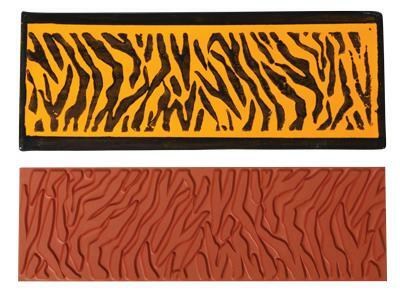 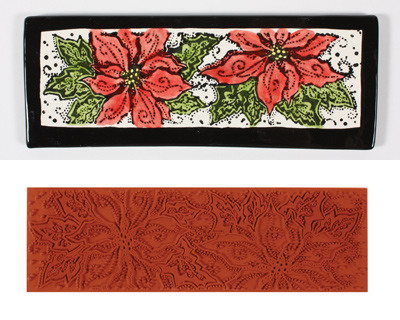 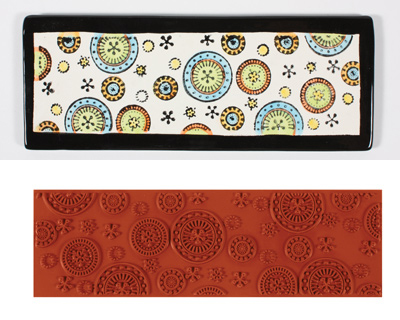 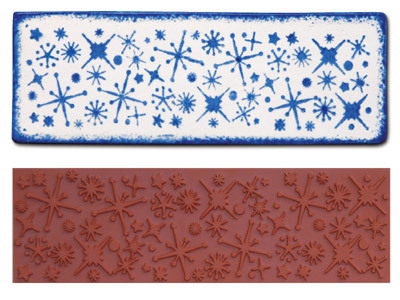 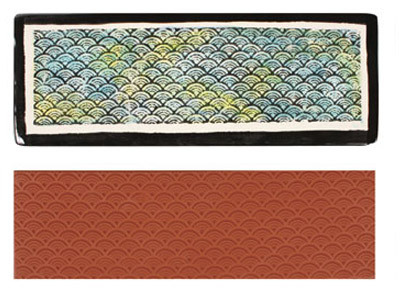 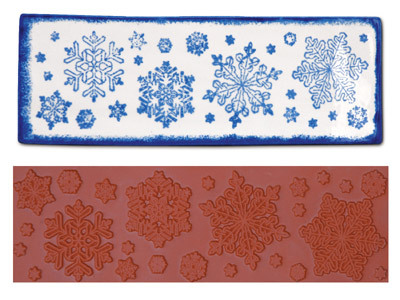 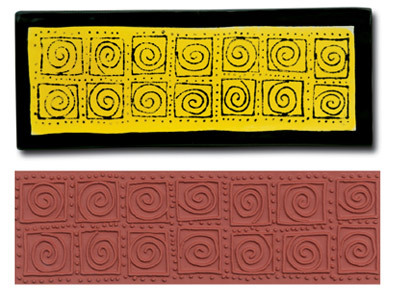 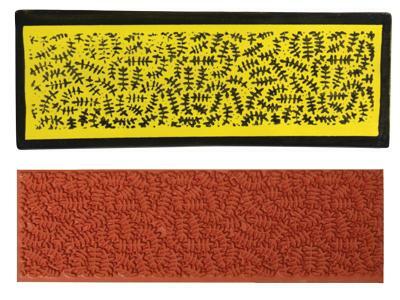 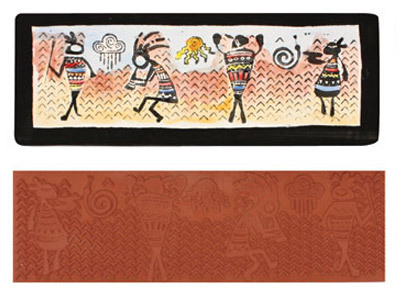 Create designs that you can use with color products (glaze or underglaze) or in moist clay. 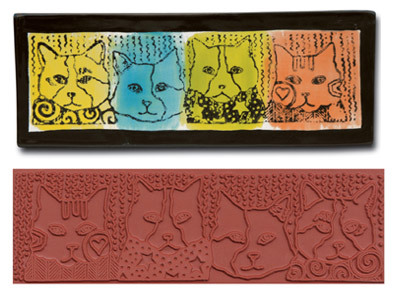 Lightly apply colors to the stamp and then press against your piece, or press the stamp into clay for design work. 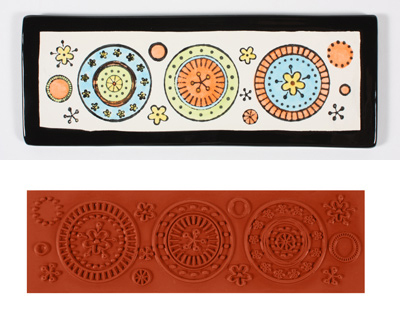 OR cut the pattern from the clay and apply it as a raised surface -- an instant sprig! 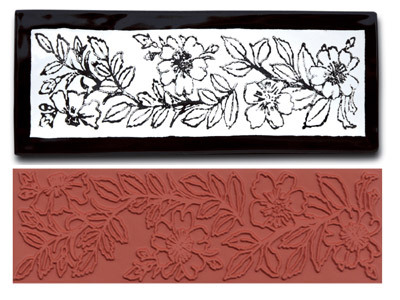 (Colored sample pictures show the effects that can be made with these stamps. 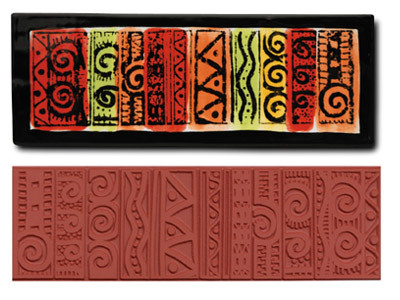 Stamps do not produce these colors on their own, and colors are not included with stamp purchase. 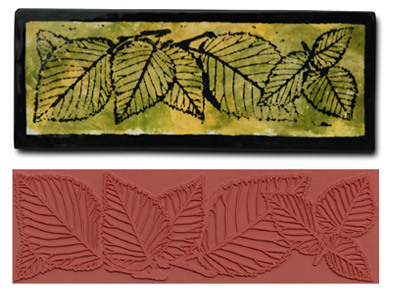 All stamps measure 2-1/8" high by 6" wide. 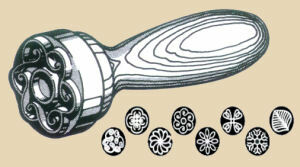 Click the small stamp images for larger pictures.